Dr. Masoom Haider’s is a radiologist with a research focus is in imaging biomarker validation using multiparametric MRI and CT. His interest is in data mining of image features (also called “radiomics”) for development of stable transplantable imaging signatures for prognostication and prediction in abdominal and pelvic malignancy. A variety of statistical and machine learning (“artificial intelligence”) approaches are applied to achieve these goals. Tumour sites of where there is ongoing research are prostate, pancreas, kidney and liver. Dr. Haider has held peer-reviewed grants from Prostate Cancer Canada, the Canadian Cancer Society Research Institute, Cancer Care Ontario and the Ontario Institute for Cancer Research for MRI-related prostate and pancreatic cancer research. 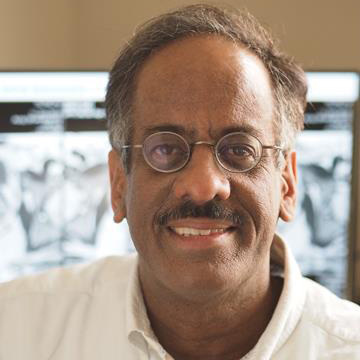 He is the imaging lead on national prospective MRI trials in prostate cancer and has worked on establishing guidelines for the use of multiparametric prostate MRI (mpMRI) for prostate cancer including the Pi-Rads standard for performance and interpretation of prostate mpMRI. In the Joint Dept of Medical Imaging and Lunenfeld-Tanenbaum Research Institute he leads the Radiomics and Oncologic Imaging Research Lab with a translational and collaborative research focus with oncologists, computer scientists, engineers, radiologists and biomedical physicists. Head, Radiomics and Oncologic Imaging Research Lab, Lunenfeld-Tanenbaum Research Institute and The Joint Department of Medical Imaging, Mount Sinai Hospital, Toronto General Hospital and Princess Margaret Hospital. Nam RK, Wallis CJD, Stojcic-Bendavid J, Milot L, Sherman C, Sugar L, Haider MA. Langer DL, van der Kwast TH, Evans AJ, Plotkin A, Trachtenberg J, Wilson BC, Haider MA. Prostate tissue composition and MR measurements: investigating the relationships between ADC, T2, K(trans), v(e), and corresponding histologic features. Langer DL, van der Kwast TH, Evans AJ, Trachtenberg J, Wilson BC, Haider MA. Prostate cancer detection with multi-parametric MRI: logistic regression analysis of quantitative T2, diffusion-weighted imaging, and dynamic contrast-enhanced MRI. J Magn Reson Imaging. 2009;30(2):327-34. Haider MA, Chung P, Sweet J, Toi A, Jhaveri K, Menard C, Warde P, Trachtenberg J, Lockwood G, Milosevic M.
Dynamic contrast-enhanced magnetic resonance imaging for localization of recurrent prostate cancer after external beam radiotherapy. Int J Radiat Oncol Biol Phys. 2008;70(2):425-30. Haider MA, van der Kwast TH, Tanguay J, Evans AJ, Hashmi AT, Lockwood G, Trachtenberg J et al. Combined T2-weighted and diffusion-weighted MRI for localization of prostate cancer. AJR Am J Roentgenol. 2007;189(2):323-8. See Dr. Haider’s recent publications on PubMed or on Google Scholar. Head of Abdominal and Pelvic MRI, Princess Margaret Hospital and the University Health Network. Improved user interfaces for image interpretation in diagnostic imaging (radiology).